Whether you eat meat or not, exploring a way of eating that includes whole foods and plant-based foods can help you not only lose weight, but help you to feel amazing by adding missing vitamins and minerals, and other micronutrients most of us are lacking because we eat so many processed foods. According to the NFVA (National Fruit & Vegetable Alliance), fruits and vegetables count for only 8% of the total calories in the average American diet. Say what? That’s pretty low! And, according to a USDA study, Americans eat more processed foods than they do whole foods: 31% more, in fact. What ends up happening to you when you eat a diet high in processed foods is, you’re either low on the recommended daily intake for certain vitamins and minerals, or you’re spending money taking vitamins and supplements. You’ll also get more cravings -- especially carb cravings -- from eating processed foods because your blood sugar is spiking. You feel hungry all the time because you’re not getting enough fiber, protein and fat from whole foods in your diet. One way to eat healthier, lose weight and feel more energized is to move away from a processed foods diet towards a whole foods plant-based diet. Basically, it’s a fancy name for eating foods that haven’t been processed or manufactured, and are grown instead of “birthed” (for the most part). So, think nuts and seeds instead of processed, sugary peanut butter. Think whole grains like oats, barley and quinoa instead of pasta, bread and cookies and granola bars. And instead of getting most of your protein from meat, you get a good chunk of it (if not all) from legumes, grains, nuts and seeds -- and surprisingly -- fruits and vegetables. Yup, fruits and veggies DO contain some protein. You can still eat meat (if that’s what you want to do) on a whole foods plant-based diet: think lean proteins like salmon, fish, and chicken instead of a fast-food hamburger with tons of fillers and ingredients you know nothing about. Can I Eat Packaged Foods on a Whole Foods Plant-Based Diet? Some whole foods come in a package or might have been processed a bit. There’s nothing wrong with that. What you want to look out for highly processed foods, where most of the nutritious parts of the food have been removed and/or additives have been added in to make it "nutritious." If you’re not sure whether a packaged food is whole foods or not, check the label for a list of ingredients. You should recognize what each ingredient is, and there shouldn’t be more than five ingredients listed (not counting spices and natural flavorings). Think of it this way: the closer a food is to its natural state, the better. Do I Have to Be a Vegetarian or Vegan to Eat a Plant-Based Diet? No, you don’t have to be a vegetarian or vegan to eat a whole foods plant-based diet. In fact, there are plenty of vegetarians/vegas who don’t eat whole foods and rely on processed foods instead. You can be a vegetarian or vegan and still eat like crap. Just like you can be a meat-eater and eat like crap. Unhealthy eating doesn't discriminate. Think of it more as a way of eating nutritious food by eating more plant-based foods, and reducing not only the amount of processed foods you eat but reducing some of the meat (especially red meat). It’s not only good for your health but good for the environment, too! What’s an Example of a Whole Foods Plant-Based Diet? 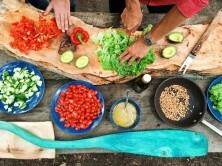 A perfect example of a healthy, whole foods plant-based diet is the Mediterranean diet [LINK]. This diet -- or way of eating -- is based on research done with people in Spain, Greece and Italy who seemed to live longer -- and healthier -- than the norm. The researchers set out to discover what it was that helped these people defy statistics, especially their lower levels of heart disease. They rarely ate red meat, unfermented dairy (e.g., milk), butter, and salt. How Much Should You Eat on a Whole Foods Plant-Based Diet? Whether you’re eating whole foods or processed foods, it still comes down to how many calories your body needs. If you want to lose weight on a whole foods plant-based diet, you still need to create a calorie deficit. Because, trust me, you can still gain weight eating whole foods. Eating healthy foods doesn’t mean you won’t gain weight. Healthy foods just means they have lots of vitamins and minerals. But that could mean lots of calories, too. One way to figure out how much you should be eating on a whole foods plant-based diet is to use portion control. My favorite way of doing this is portion control using hand-size portions. On average, a woman would eat approximately 1 palm of protein, 1 closed fist of vegetables, 1 cupped hand and 1 thumb of food at each meal, four times a day. You can learn more about hand-size portions here: How Hand-Size Portions Can Help you Lose Weight I made a video so you can see exactly what I mean, and there's a free guide you can download to help you understand hand-size portions better. There are several things you can to do move away from a processed foods diet and towards a whole foods plant-based diet. Put your scientist hat on and become more aware of what you’re eating. Check food labels for ingredients as mentioned up above. Track the types of foods you eat for a week. And then, take an honest and objective look at your habits. Do you eat more processed foods than whole foods? Where can you make changes towards a more whole foods plant-based diet? Start by adding more vegetables to your meals if you don’t eat a lot of vegetables. The trick here is to add vegetables you love to eat. It doesn’t make sense to eat broccoli if you hate broccoli, right? Aim for half of your plate to be vegetables or, using hand-size portions, aim for 1 closed fist of vegetables. Make a list of ten whole foods you love to eat. Then, find at least one recipe that uses at least two or three of those ingredients. That will be enough to get you started. If you’re feeling more ambitious, you can find a few more recipes. Open up your food pantry and do an honest -- and objective -- assessment of what you find in there. Are there lots of processed foods like bread, pasta, cookies, crackers, granola bars (yes, granola bars), instant oatmeal, etc. No judging allowed here! Don’t think that you’re “bad” or “have no control” when doing this. Just be aware of what’s in there and think of ways you can make changes. If any of this sounds overwhelming, I’m here to help! Eating whole foods in a healthy way to lose weight is what I do. You can hire me as your online nutrition coach to help guide you from eating processed foods and feeling like crap to eating healthy whole foods and feeling energized. I’ll show you exactly what to do, with foods YOU love, so you can lose weight and feel amazing. Click here to learn more about my coaching program. Use the Contact Me button to ask me any questions.